Poblano peppers are the bees knees, and they pair so well with the portabello in these burritos! I am way excited to make these soon! You and me both, girl... I see enchiladas and mentally bookmark the recipe immediately! In fact I totally mentally bookmarked this one... and maybe even pinned it! ;) Looks heavenly! I love your Mexican dishes. I know I'll be trying this one out! Seriously, isn't that sauce the bomb? Love it. Thanks for linking up. I'm glad you liked it! Can one have too many enchilada recipes? NO. Can I find something to fulfill my love for new enchilada recipes? YES. Can I find some new veggie and black bean enchiladas to replace the hideous ones I posted in my early blogging days? Thank God, YES. I'm making enchiladas this week and now I'm thinking that maybe I should swap out the recipe I'm using for this. I do love me some poblanos! I love trying all different fillings and sauce combinations for enchiladas. They are so fun and tasty! These look great and I love the poblano sauce. I, too, am always tempted to try a new mexican recipe every time I see it. Hence the bookmarked page here! Thanks for another yummy recipe, as always! I made these last night, and they were fantastic. One of my new favorites! Ohhh my gosh. I am eating these now. Amazing! If you have any left over sauce like I did (all I had was a 28oz can of tomato) it makes an awesome salsa for chips too! 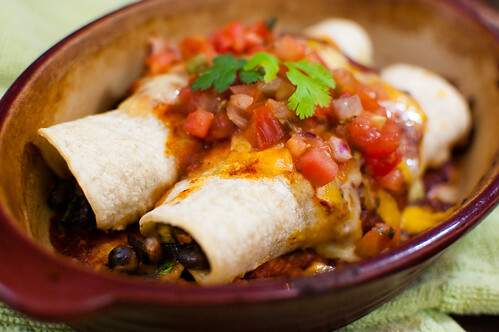 made these and your chicken enchilada's many times! Might have to try the poblano sauce with chicken! So good. Thank you! !